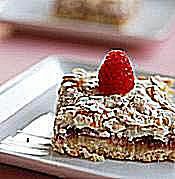 Louise Cake is an old-fashioned New Zealand favorite consisting of a thin base layer of cake or biscuit crumbs (cookie crumbs) topped with raspberry or plum jam, coconut meringue and then baked in the oven. There are slight variations from region to region and family to family. It is also called Louise Cake Slice because it’s baked in a rectangular pan and cut into squares. The cake is said to be named after Princess Louise of England, Queen Victoria’s daughter. I like to add a sprinkling of fresh raspberries for a tart twist to the sweetness of the cake. Kiwi cooking bible, "Edmonds Classics" rated the Louise Cake sixth in the "Top 10 Favorite Kiwi Recipes." Lightly grease an 11-inch x 7-inch rectangular cake tin. Line tin with baking paper and allow the paper to hang over the edges a little to facilitate the cake’s removal once it’s baked. To make the cake: In a mixing bowl cream together the butter and sugar until light and fluffy. Add three egg yolks, one at a time, beating well after each addition. Sift flour and baking powder together. Fold into the creamed butter-sugar mixture. The dough will seem quite crumbly, but this is normal. Press dough into the bottom of the lined cake tin. To make the coconut-meringue topping: In a clean bowl, use an electric mixer to beat the three egg whites until they form soft peaks. Gradually add 1/4 cup castor sugar, one tablespoon at a time, while continuing to beat the whites until they form stiff, glossy peaks. Use a spatula to gently fold in the desiccated coconut and vanilla essence (extract). Using a spatula, spread a thin layer of jam over the dough in the pan. Next, spoon and spread the coconut meringue over the jam, making sure the meringue completely covers the jam. Bake for 20 to 25 minutes or until the meringue top is a soft pink eggshell color. It is normal for the meringue to crack, so don't panic. Remove from the oven and cool in tin for two to three minutes. Carefully remove the cake from the tin by holding onto the baking paper and gently lifting. Cool on a wire rack. Once cooled, cut cake into squares and serve topped with fresh raspberries, if desired. The Louise Cake can be kept in an airtight container for up to one week.